Coach Brent interviews Penn State Football’s newest commit, standout Kicker/Punter Chris Gulla, from Toms River HS North in New Jersey. He shares his college football journey. Today I had the pleasure of interviewing one of my long time students and fellow Jersey Shore (no, not the TV show) native, Chris Gulla. Chris is a Class of 2013 Kicker/Punter from Toms River High School North in Toms River, NJ. Chris Gulla committed to Penn State University today! Chris started training with me the summer before he entered 9th grade. Being from the same neighborhood, we hit it off. Over the course of 4 years training together, Chris was able to master his kicking and punting skills and become a weapon for Coach Chip LaBarca Jr. (Head Football Coach & PSU Alum) and the Toms River North Mariners. At the age of 14, four years ago, Chris turned heads with an impressive camp performance and YouTube Video where he kicked 55 yard field goals with only 1-step! After that camp, I think Chris, his Dad, and I knew that one day he would be making his commitment to a top school in the country. In the playoffs of Chris’s freshman year, he got his first start on Varsity and held the starting position for the remainder of his career at Toms River North! While I don’t live in New Jersey anymore, (based in San Diego, CA), I still get to come back ‘home’ 4+ times a year for camps, private lessons, and to visit my family. Chris and I trained whenever I was in NJ and we also did ‘virtual private lessons’ via Skype, online video review, and e-mail. Chris and I would link up a couple times a year to keep his form sharp. We’d also work together on blasting out e-mails and phone calls to college coaches & recruiting coordinators to help garner their interest and begin the ‘recruiting process’. My father works out at the same gym Chris goes to and he would often send me updates about how hard Chris was working in the gym. If you didn’t know Chris was ‘just a kicker’ you would seriously think he’s a WWE superstar (come on, look at those biceps!). Chris trained relentlessly year-round and all his hard work, drive, and commitment to be the best surely paid off today! It’s been my pleasure to have had the opportunity to coach Chris Gulla and see him grow into one of the best kickers in the country. Without further ado, I give you ‘the interview’ of Christopher Gulla, 2012 Asbury Park Press 1’st Team All-Shore Kicker, 2012 Kicking World All-American Kicker, and most importantly, Pennsylvania State University’s newest football commit! A. I started playing soccer at a young age and always had a strong leg. I originally was trying out as a Quarterback by freshman year but had an elbow injury from baseball. I asked the coaches if they would give me a chance to kick and the rest as they say is history. Q. What other sports have you played in HS? A. I was a pitcher in baseball and a goalie in lacrosse. A. Least: definitely Biology! Favorite: US Government. A. I started to get my name out there with the YouTube videos, sending emails to coaches, making phone calls, etc. It started getting serious going into my junior year. I received interest from several schools around the country and had official visits with UMass and Penn State. A. I had a very good 2012 summer college camp at Penn State and that put me ‘on the board’ at several major schools. The game-winning kick early in the season didn’t hurt either! Q. What ultimately led you to commit to Penn State? What other schools were in the running? A. I have wanted to play for Penn State since as early as I can remember! The weight room, indoor practice field, and coaches are the best in the country. The education and Alumni network is excellent. Last week I met with Coach O’Brien and he made it clear that I would be given a fair shot at earning a starting spot as a freshman. Also, being able to play at a Big 10 school in front of a large crowd is very appealing! Q. Do you have any ‘tips’ for other high school football players who strive to play at the next level? A. Get your grades up. Take prep courses for the SATs & ACTs. Hit the weight room to add muscle and core strength. Work on stretching and muscle memory drills. Get a good private kicking coach. Video tape your kicks to learn from them and also get your name out there. The recruiting process is very time consuming and it’s full of highs and lows. It is important to stay focused, never give up, and treat every coach with respect. You just never know who might know who. Carry yourself professionally and always work hard. A. That there are good times and bad times and neither lasts forever. Surround yourself with positive people. Q. Is there any person(s) in your life who has had a major impact on your football or personal life? A. My parents and my extended family. A. My mom’s Chicken Parm! Q. What does being a ‘local’ mean to you? A. Being a ‘local’ at the Jersey shore means hanging out at the beach and surfing. Q. What’s your take on ‘fist pumping’? A. The tourists always do help pay the bills. Q. What’s the future plans for your hair? Q. Do you have a favorite motto or belief you hold true to your heart? Q. How will you be successful over the next 4+ years at Penn State? A. Having to manage conditioning, practice, and a full class load ˗˗ I’ll need to stay organized and focused. From a former (‘99) All-Shore Kicker to the newest kicker to be honored into the All-Shore club, I wish Chris Gulla a tremendous experience at Penn State University filled with fun, friendships, memories, and success in football and in life. I’m very proud of you Chris! Happy Valley will have a weapon for the next 4 years! ‘We Are’, ______ _______! 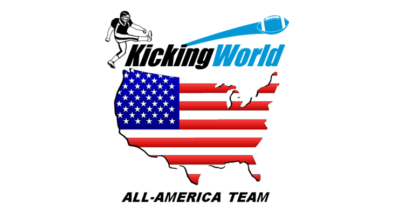 Interview by Coach Brent Grablachoff, Owner & Head Coach of Kicking World. This is an interview conducted on December 18, 2012 between Coach Brent and future Penn State University Kicker/Punter Chris Gulla from Toms River, NJ.